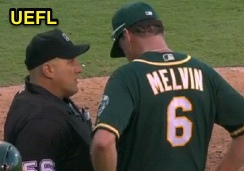 HP Umpire Eric Cooper ejected Athletics DH Khris Davis for arguing a strike three call in the top of the 8th inning of the Athletics-Angels game. With none out and none on, Davis took a 3-2 slider from Angels pitcher Joules Chacin. Replays indicate the pitch was located off the outer edge of home plate and thigh high (px 1.226, pz 2.354) and the strikeout was called on the pitch location (this supersedes the issue of check swing), the call was incorrect. At the time of the ejection, the Athletics were leading, 6-5. The Athletics ultimately won the contest, 8-6. This is Eric Cooper (56)'s first ejection of the 2016 MLB regular season. Eric Cooper now has -3 points in the UEFL Standings (-1 Previous + 2 MLB - 4 Incorrect Call = -3). Crew Chief Gary Cederstrom now has 7 points in Crew Division (7 Previous + 0 Incorrect Call = 7). This is the 125th ejection report of the 2016 regular season. This is the 59th player ejection of 2016. Prior to ejection, Davis was 1-4 (2 SO) in the contest. This is Oakland's 4th ejection of 2016, T-1st in the AL West (HOU, LAA, OAK, TEX 4; SEA 1). This is Khris Davis' first career MLB ejection. This is Eric Cooper's first ejection since June 23, 2015 (Mickey Callaway; QOC = Y [Balls/Strikes]). Wrap: Oakland Athletics vs. Los Angeles Angels, 8/4/16 | Video available via "Read more"